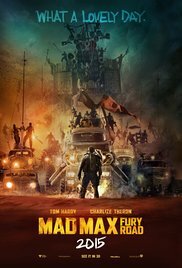 There’s one word that comes to my mind after watching “Mad Max Fury Road“, and that’s the word “madness”. This is a perfect visualization of what the term madness means. I truly believe that the creators and writers of this hallucinatory trip were fed with hallucinogens. A spacious cocktail of exotic mushrooms, barbiturates and other drug-related products. Otherwise I wouldn’t know how they could think up this crazy, wacky post-apocalyptic film. A film that feels as if it consists of a single action scene. You’re not given a moment to catch your breath. It’s undeniable that this movie adopted the concept of “Mad Max” from 1979, a legendary cult film with young Mel Gibson in a leading role. The same desolate and parched Australian landscape with a shortage of water and petrol governed by fanatical gangs. I must confess I’ve already watched this film a while ago and I never saw the need to publish my review. I thought that my opinion would contribute nothing to the general opinion that you could read here and there on the internet. Everyone uses the same superlatives and glorifying terms for this extravagant action movie. In general, everybody agrees this is an insanely great, explosive, ingenious and never tedious re-boot.“It’s loud. It’s unrelenting. It’s crazily exciting, and, at times, it’s just bloody weird”. “Why repeat this again?” I thought to myself over and over again. But recent events forced me to rewrite it a bit and highlight an additional aspect that’s applicable to today’s events. We return to the scorching desert in a post-nuclear world where people struggle to survive and follow crazy figures that rule over vital resources such as oil and water. Someone like Immortan Joe (Hugh Keays-Byrne), who thinks he’s a kind of god and tyrannically keeps his followers in his grip. He rules the Citadel (an old water reservoir) and has his own private army of fanatical War Boys. This Mad Max episode shows how this lawless gang of lunatics start chasing Imperator Furiosa (Charlize “The Italian Job” Theron). She kidnapped Joe’s harem (including Zoe Kravitz, daughter of). She’s later assisted by Max Rockatansky (Tom Hardy) who serves the first half hour as a living blood supply for War Boy Nux (Nicholas Hoult). After the terrorist attacks in Europe and hearing a debate about the motives of a suicide bomber, I came to the conclusion that the creepy War Boys exhibit similar characteristics. They follow blindly a charismatic leader and sacrifice themselves for the greater goal. A hero status is awaiting them when killed in battle. They earn a one way ticket to a paradise they call Valhalla. By sacrificing themselves they become immortal in one fell swoop. Strange, but after the IS attacks, I immediately thought of this brainwashed gang. A similar motivation and the same destructive self-sacrifice.And then there’s the guitarist firmly attached with elastics who’s stirring up the troops into action, while he’s playing his flame-throwing guitar. An absurd image amidst total chaos. Similar to the drummer at the forefront during the battles at Waterloo. Or “Piper Bill” who walked undisturbed on the beach with his bagpipes at Normandy landings in WWII. It’s evident that every fiction film contains comparables with reality sometimes. But beyond these serious digressions that overtook me, I can only recommend to watch and enjoy this macho blockbuster, filled with action-packed chase scenes with futuristic cars. A with diesel and gun smoke smelling stunner that deserves to be titled “Furiosa: Fury Road”. Charlize Theron effortlessly outperforms Nicholas Hoult. It’s not Mad Max who demands the lion’s share of attention. You can call him Mad “Drip feed” instead.